A MAN IN his 40s has died and a garda has been injured in an incident involving two cars in Co Monaghan last night. A garda had attempted to stop a silver Audi A6 close to Castleblayney Garda Station at around 11.30pm yesterday. 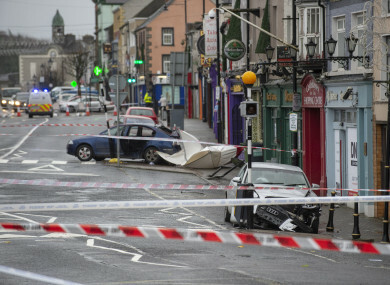 The Audi drove off and the garda was dragged by the car for about 500 metres before it crashed into another car, a Skoda Octavia, on the Main Street. The driver of the Skoda, a man in his 40s, was pronounced dead at the scene. His body has been taken to Our Lady of Lourdes Hospital Drogheda where a post-mortem examination will be carried out by the State Pathologist. The driver of the silver Audi, a man in his 40s, was arrested at the scene and is detained at Carrickmacross Garda Station under Section 4 of the Criminal Justice Act, 1984. The garda, a man in his late 20s, is being treated for facial, head and leg injuries at Our Lady of Lourdes Hospital in Drogheda. The Garda Síochána Ombudsman Commission has deployed a team of investigators to the scene to further examine the incident. The matter was referred to GSOC, the garda watchdog body, under Section 102 of the Garda Síochána Act 2005, which provides for independent investigation of any matter that appears to indicate that the conduct of a member of An Garda Síochána may have resulted in the death of, or serious harm to, a person. Robbie Peelo, interim deputy general secretary of the Garda Representative Association (GRA) said this incident highlights the risks gardaí face in their jobs every day. “The dangers faced on a daily basis, by members throughout the force, but in particular by those deployed as frontline uniform members are brought to the fore by incidents such as occurred in Castleblaney last night,” he said. The road at Main Street is closed to facilitate an examination of the area by Garda Forensic Collision Investigators and Crime Scene Examiners. Local diversions are in place. Any witnesses are asked to contact Carrickmacross Garda Station on 042 9690190. With reporting from Adam Daly and Michelle Hennessy. Email “GSOC launches inquiry after driver killed and garda dragged for 500 metres by second car in Monaghan”. Feedback on “GSOC launches inquiry after driver killed and garda dragged for 500 metres by second car in Monaghan”.